The latest release from luxury fragrance house Amouage is Beloved, a tribute to the "elegance and complexity of the modern woman" (in general) and the classic sophistication of women who shop at Bergdorf Goodman in New York (in particular). Beloved was developed for Amouage by perfumer Bernard Ellena and includes top notes of jasmine, purple rose, lavender, clary sage, clove bud, chamomile, and cardamom; heart notes of ylang-ylang, violet, everlasting [immortelle], cistus, benzoin, olibanum, and patchouli; and base notes of cedarwood, sandalwood, castoreum, civet, leather, musk, vanilla, maltol, and amber. Although I always enjoy shopping for fragrance and cosmetics at Bergdorf Goodman, I'm probably not the quintessential "Bergdorf woman," however you may picture her. 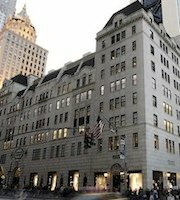 On the other hand, I do have a longstanding personal and sentimental connection to the place: my great-grandfather and great-aunt both worked at Bergdorf Goodman, as a tailor and couture seamstress, respectively. My love for spending time in New York department stores is apparently a product of nature as well as nurture. Can I, as a not-so-glamorous customer at Bergdorf and a mostly-modern woman, enjoy Beloved? I certainly can. Overall, I'd describe Beloved as a powdery floral-oriental and as a contemporary fragrance that feels "vintage" in style and quality. Its introductory phase smells slightly herbaceous, with the clary sage waving a quick greeting before the composition moves ahead into its flowery and spicy-resiny stages. The floral heart is a little bit sweet and a little bit slinky, with a dose of dusty-sweet jasmine and some sharper ylang-ylang beneath it. Beloved later reveals an animalic swirl of civet and castoreum (their synthetic equivalents, at least!) and a hint of leather, the sort of notes that rarely appear in today's feminine fragrances, while still remaining womanly. Hours after application, the fragrance feels much softer than than it did at the outset, leaving an accord of ambery and resinous notes clinging to the skin. (At one point I forgot what I was wearing and thought I was smelling my nearly-finished Diptyque Oliban candle, which was sitting across the room; it's fragrant even when unlit.) The entire composition unfolds very gradually, almost as though it were being played or projected in slow-motion. Beloved reminds me — particularly in its later phases — of a vintage perfume, but I'm not sure whether I'm thinking of a particular perfume or just a broader style of vintage fragrance. Something about Beloved's powder-dusted jasmine-and-civet blend brings Bal à Versailles to mind. Unfortunately, I haven't been able to find my sample of Bal à Versailles for a quick comparison; in any case, Beloved is probably not quite as heavy and sultry as that 1960s classic. Lastly, don't let the pink packaging mislead you: there is nothing bubbly or girlish about Beloved. It's opulent and confident. It's a foreign film, not a sitcom; a historical novel with many characters, not a self-help guide to finding the right man. It's a fragrance for formal evenings out, romantic evenings in, or perhaps just a purposeful stride down Fifth Avenue to do some shopping at your favorite upscale department store. Amouage Beloved is available as 100 ml Eau de Parfum ($430). It will be sold at Bergdorf Goodman, Harrods, Tsum, and Amouage boutiques. Note: top left image is Bergdorf Goodman [cropped] by Chrisopher Peterson via Wikimedia. Top right image is Helen Lee Worthing for US Vogue, December 1919 via Wikimedia. My heart nearly stopped in my chest when I saw the price. I know Amouage is known for creating beautiful fragrances but $430? Not in this or any other lifetime! I had the same heart stopping experience! I know… it’s definitely a luxury item! Thanks for the review, Jessica. Beloved sounds gorgeous and something that I might enjoy. It’ll be on my to-try list. Bal à Versailles was my first grown-up perfume. I think I was about 10 when my father brought it back from Paris. I think I have the bottle somewhere and it might still contain some perfume. I wonder how it smells like some 30+ years later. I don’t know why my father thought about buying me perfume at that age, but I was awestruck by its beauty. It was so precious to me that wore it very sparingly, so I am sure I still have some left. If Beloved is evocative of it, it is a must-fry for me! Wonderful review as always, Jessica. How very interesting that you had relatives that worked at Bergdorf’s! DId you inherit the sewing gene? That is one interesting list of notes, but I doubt I’ll give it a whirl. The Amouages all seem to give me headaches – the only brand to do so. Jessica: that is a sweet story about your grandparents. A good seamstress or tailor is hard to find!!! I imagine they made you beautiful clothes too? I really appreciate your review of Beloved. It sounds right up my alley, if my alley was paved in gold. It makes me happy that Amouage is adding another well crafted fragrance to it’s ranks. And I love vintage Bal a Versailles too, so any comparison to that makes me happy. I’ve often thought that Amouage Memoir has a similar heft and progression as vintage BaV, even though they smell differently, so I can appreciate what you are saying about Beloved. The “heft and progression” idea makes a lot of sense to me, AnnS! And yes, my great0grandfather and grandmother and great-aunts all did make wonderful clothes for my mother; one of the great-aunts even made my mother’s wedding dress, which I myself wore on my own wedding day just a few years ago. It was a special experience! Oh, boy! I’m not sure if I should thank you for the review since Amouage is one of my absolute favourite perfume houses and this sounds like a must try. I just hope that, eventually, it will be available from more stockists since I’m nowhere near London. Oops, sorry about that, Abyss! I’ve never been all-or-nothing with Amouage: some of their fragrances I respect for being complex and well-made, but I can’t personally wear them, while others do make me swoon. Beloved has turned out to be one of the swoony ones! Well, poop. And here I thought that this might be the one Amouage I didn’t have to try; now it sounds so lovely that I’ll have to search out a sample. I thought maybe it would be too one-note girly, but it sounds as sophisticated and complex as all the other Amouages I love. hah! I’m sorry, Missie Sue. I don’t know whether it will be to everyone’s tastes, but it certainly isn’t girly or one-note. Generally I get on well with Amouage, and Beloved has lotsa stuff that I usually like very much. $430 is still a bit rich for me, but I’ll sniff if I get the chance. It *does* feel a bit steep… I suppose if we only purchased one bottle for the year, and knew that one spritz of this goes a long way (which it does), we could justify it…? Lemming! Great review. Can’t wait to try it! Now…just need to track down a nice decant for sampling. Lovely, lovely review which I enjoyed enormously even if, living in Australia, I don’t quite get the Ne York context, or can ever afford even a dab of Beloved. It got me thinking about what characterises a vintage fragrance tho’, as I am wearing Habanita today. It’s got something to do with notes that are no longer fashionable in mainstream fragrances (animalic notes, leather, oakmoss). But it it is not just notes. Vintage fragrances are often complex, diffuse, long-lasting and, as you say about Beloved, confident. Need to think some more about this. Would you say that Beloved has deliberately retro characteristics, like recent releases from Tauer, Sonoma Scent Studio and DSH? Annemarie, I think that’s a very apt way of describing the “vintage” sensibility in fragrance — all those characteristics you mentioned. And I did think of SSS Nostalgie while I was trying Beloved; not they smell anything alike, but they both reminded me of the experience of sniffing and/or trying vintage fragrances. Oh shoot. Can I echo equal parts of enthusiasm for the scent and disappointment at the price? Sigh. I will probably sniff it, anyway, and then hopefully it will not be love. MR, I don’t think you’re alone in that reaction! but do give it a sniff if you have the chance. This has me wondering just how much I would be willing to spend for a perfume if I really loved it. Would I justify it by saying I spend that much over the course of a year or so on bottles of other things? Poodle, it’s almost a philosophical question, isn’t it? How cool to have a BG connection, Jessica! Must sample this. Not much chance of a bottle, but how likely am I to use more than a decant in this lifetime, anyway, LOL? Noz, I hope that some will come your way! I’m still working my way through a little spray sample, since it’s fairly rich and I only need a spritz at a time. I love Beloved so much, especially the dry down. It just lingers on the skin effortlessly and giving the feeling of total comfort. I’m not very good with notes and describing perfumes, I just know when I really love a perfume. But I’m writing as I wanted to share really lovely experience at Harrods. Beata, Thank you so much for sharing this experience! It’s so wonderful, to fall in love with a fragrance in that way. And you had such nice service at Harrod’s, which makes the experience even better! I’m so happy for you. You’ll really cherish that bottle when you own it… and, fortunately, this is a long-lasting fragrance, so you’ll be able to use your bottle for a long time to come!